In traditional Coast Salish society blankets held much importance. Blankets were the primary medium of exchange. As well as serving many practical functions, they held much spiritual significance. Coast Salish weaving was a fundamental part of a Coast Salish woman's identity. A high quality blanket took months or years of work to produce. Since time immemorial Coast Salish women wove blankets with a wool composed of mountain goat hair mixed with the hair of (now extinct) wool dogs. The blankets were used as bedding, clothing, ceremonial regalia, and as room dividers, floor mats, and outer wall insulation. As well as being highly functional goods, they were also invested with much spiritual power. Wool links the Coast Salish to where they came from. Mountain goat wool is a gift from before time. Wool dogs were magical creatures. Blankets are invested with many layers of spiritual meaning. Their quality was the equal of Southwestern Navajo blankets and Northern Tlingit Chilkat blankets. There were many mountain goats on the coastal mountains of the mainland. In the spring they’d shed their coats by rubbing against bushes. Coast Salish families would travel into the mountains and gather up the hair. On Vancouver Island, where they didn’t have goats, the people bred wool dogs that they sheared up to three times per year. These dogs were kept confined on small islands to keep them from mixing with other dogs, and they were fed a special diet to increase the quality of the wool. The goat and dog wools were mixed together to create Salish Wool. The women's exchange of goat for dog wool was part of a larger Salish trading network. When the two wools had been acquired they teased them to remove dirt, removed the course guard hairs, and mixed them. ‘Diatomaceous earth’ was then pounded into the wool. This was a fine processed dust that cleaned the wool, deodorized it, made it waterproof, and gave it thermal and insecticidal properties. Additional filler product was added (stinging nettle fibre, Indian hemp, milkweed, cottonwood, fireweed fluff, cedar twine, down from waterfowl). The wool was combed and spun into yarn, sometimes dyed with plant dyes, and then woven on wooden looms. Coast Salish blankets were generally white twill-weave or twined featuring repeated geometric designs, and were thick and heavy. Blankets were a primary form of currency with a high value attached to them. They were given as payment to witnesses at namings, marriages, funerals, and other important events. Women had a high status in Coast Salish society because they produced the blankets so necessary in their culture. The ‘Puberty’ or ‘Coming of Age’ ceremony for young women was an initiation into woolworking. Men produced intricately carved tools (beaters, combs, spindle whorl, looms) for the women. 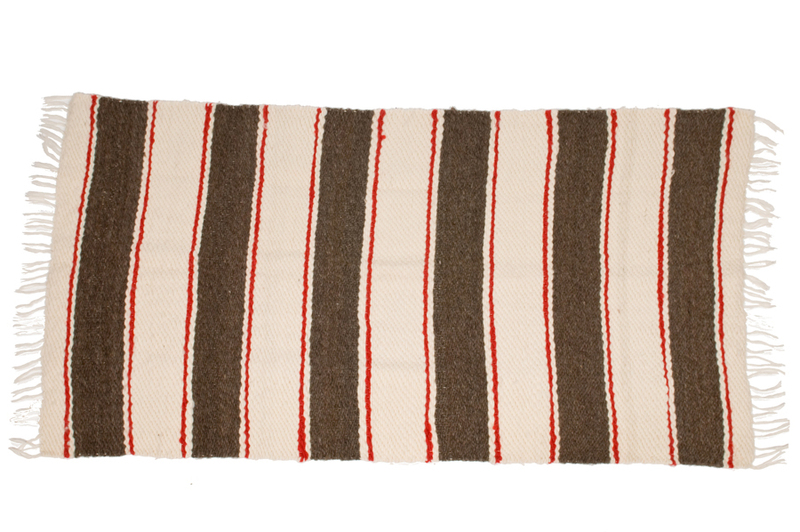 Click to view Traditional Coast Salish blankets hand woven by Keith Nahanee.